This behavioral economics podcast is about the psychology behind economic booms and busts. The first big bubble on record happened almost 400 years ago and there have been countless since then…so why haven’t we learned to avoid them? Why do we keep falling into the same traps over and over again? This is where the “behavioral” part of behavioral economics comes into play. This episode is relevant today because of the current status of the stock market, which had a tumultuous 2018 to say the least, as well as the recent rise and fall of cryptocurrency. In this episode, I will cover optimism bias, overconfidence, herd mentality, time discounting, and emotions like envy and excitement. [04:04] TULIP EXAMPLE – One of the earliest known bubbles happened in the late 1630s when Tulipmania struck Holland. [04:43] WHAT CAUSES BUBBLES – When excessive demand for an item drives the price up so it is far above the intrinsic value, it forms a bubble. [05:11] When the general population realizes that the prices are over inflated, everyone tries to get out at once causing a crash. [05:42] BEANIE BABIES – the beanie baby bubble took place about 20 years ago. [05:56] The genius strategy of retiring beanie babies, creating scarcity and increasing their value dramatically happened more by accident than anything else. [07:15] Ty changed the framing message by telling buyers that Lovie the lamb had been retired not that it was a supply issue. [07:30] Disappointed buyers were suddenly delighted at the prospect that Lovie might be worth more than what they originally paid. [07:42] Warner then begin intentionally retiring Beanie Babies. [08:56] Four women in Chicago who saw the potential of buying retired Beanie Babies actually started the craze. [09:16] As excitement caught on, Beanie Baby prices began to rise. [09:55] The entire bubble lasted five years. [11:30] Just like the Tulips, it all came crashing down. A retirement was announced in 1999 and prices remained stable. A release of 24 new beanies on that same day was overwhelming to investors and sales began to decline. [13:23] The first concept in the brain that contributes to forming bubbles is our bias toward optimism. A bias toward optimism is what makes people underestimate the chances that we will be in a car accident or get diagnosed with cancer relative to other people. [14:08] On the flip side, we may say that winning the lottery is a one in a million shot…but we still think WE have a good chance of winning. [15:01] We have a hard time not imagining what it would be like and our optimism bias tells us “that could be me!” which combines with perceived ownership and makes you feel like it is worth the small risk to play. This is the concept of availability, which was the topic of episode 15. [15:43] The anticipation releases dopamine and gets your brain excited about the opportunities. This creates a quick feedback loop, which gets people caught up in the hype of the bubble. [16:12] OVERCONFIDENCE – Consider something people say “can never fail” as a red flag. [17:27] HERD MENTALITY – We also get swept up in the hype because of our herd mentality, which was the focus of episode 19. [18:21] When an animal is part of a herd, it is best to simply follow everyone else. [19:16] Do your own research, don’t get swept up in the hype of others in the herd. [22:33] Once something hits the mainstream and “everyone knows” it is a hot buy…it is probably past the point where you should have bought in. [24:01] TIME DISCOUNTING – We are programmed to see the immediate benefits and risks, and disproportionately weight them against future benefits and risks. [26:16] Value fluctuates, and it is easy to feel as if you “had” the money and dream about all the things you could do with it, but in many cases that is simply on paper. [27:56] Because our brains claim ownership over things very quickly, it is difficult to not get emotionally invested in the highs and the lows. 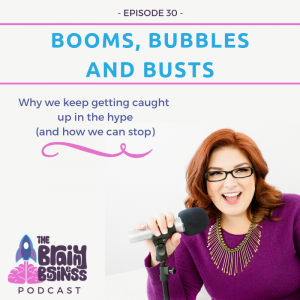 [28:27] EMOTIONS – With bubbles, booms and busts, we let our emotions get the better of us and we quickly become our own worst enemies. [29:55] WHAT TO DO – If someone comes to you with an investment that seems too good to be true, it probably is. Consider going against the herd and finding new opportunities. [30:19] Self-confirmation bias is where we have a tendency to confirm our own beliefs.